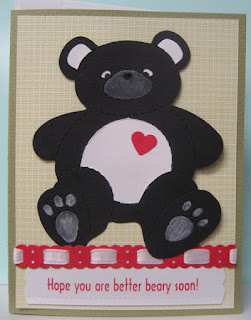 For my last card I wanted a fairly quick card so I created these great cards with fun greetings!! For anyone wanting Easter cards I had a few "hopping" greetings!! 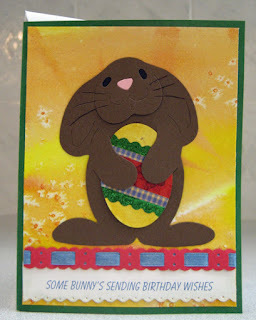 I checked the internet for bunny greetings and found quite a few fun ones which I incorporated into my kits. The teddy bear also provided the opportunity for some fun greetings which are "beary" special. I have owned both of these dies for quite a long time and had only ever cut them once to provide a white cardstock sample which I store with the die. 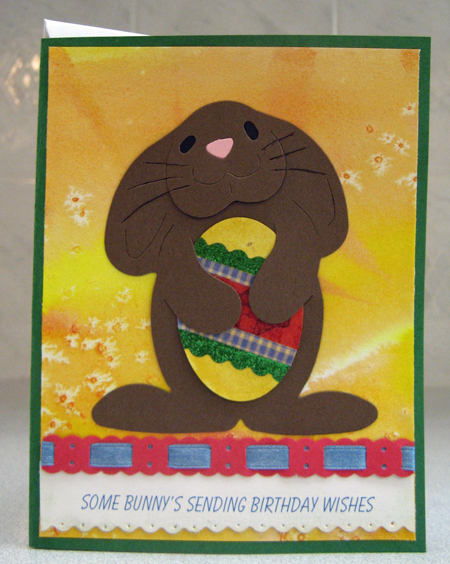 I cut the bunnies mostly from brown cardstock and inserted a pink nose which I die cut from scraps. I adhered a scrap of black cardstock behind the face to give it black eyes and highlighted the whiskers with a fine tip black permanent marker. I gave all the bunnies an egg to hold which I created with an oval punchie embellished with washi tape. They look pretty cute! The die comes with a flower for it to hold. It will be fun to see how many other items I can find to put in its hands. For the bear I cut the first one from black cardstock and cut the other little pieces from white cardstock, fussy cut them and glued them in place. I watercoloured the muzzle and the paws. Black would not work for eyes on this one so I put a piece of white in behind and added a dot with a black marker to create his eyes. For all the others I cut them from different colours and used black on the back to create the eyes and watercolour to embellish their noses, tummies and paws. I added coordinating hearts to all of their bellies!! I created the coordinating ribbon embellishments as well. I punched the cardstock strips with a border punch (SU), trimmed out every third set of holes with an exacto knife and then threaded through 1/4" ribbon securing the ends to the back using double sided tape. I made all of these ahead of time!! Assembly was fairly easy. Glued the backgrounds to the coordinating card fronts - scrapbook paper for the bear and hand decorated watercolour paper for the bunny, added the trimmed and embellished laser printed greetings and then positioned the ribbon embellishments above and over them. The final step was to add the bears/bunnies with 3D foam tape to give them some dimension. Great cards!! So glad I finally pulled these dies out and used them!! They will make fun cards with special greetings!!! A few more Easter cards! !